Rated amongst the best golf courses in Mexico, Estrella del Mar boasts a magnificent 18-hole championship golf course. Designed by the legendary Robert Trent Jones Jr. and built in 1996, the Estrella del Mar Golf Course is unsurpassed in terms of play and breathtaking scenery. 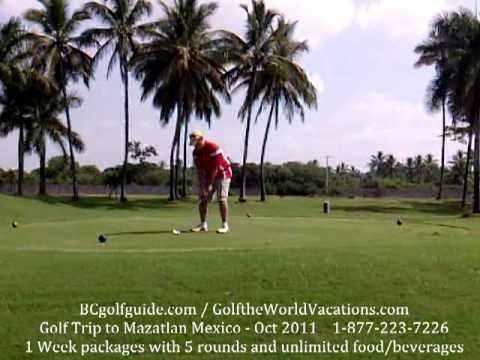 With only two other golf courses in Mazatlan, there is simply no comparable course in the Mazatlan area.The course layout is parallel to the 3.5 miles of pristine beach in the gated community of Estrella del Mar. Six of the holes and fairways are situated right off the beach where spectacular views abound. The tropical landscaping is all you would imagine in your dream golf course, with clusters of palms lining the fairways, strategically placed bunkers, the sound of waves lapping on the sand and impeccably manicured greens.